Buying a new shower can be arguably one of the trickiest aspects of installing a bathroom. The main reason being, that it's all well and good installing a shiny new, all-singing, all-dancing shower, but if your water pressure isn't much cop, you'll be left standing under a dribble, instead of the invigorating torrent you were hoping for. To help boost your flow rate, a shower pump is often the best solution, but do you actually need one? You should be able to immediately tell if your water pressure is poor. If you have an existing shower, you will already have noticed that it isn't as powerful as you like. If you don't already have a shower, see how quickly your toilet cistern takes to refill or how quickly it takes to fill your bath. A good flow rate is considered to be anything over 15 litres per minute. To get an accurate measure of your water flow (how quickly your water is delivered), check out our guide to understanding water pressure. If you have identified that you have low water pressure, the next best step is to buy a shower pump which will help to increase the flow to your shower. But before you choose a pump, you will need to check which hot water system you have in your home. 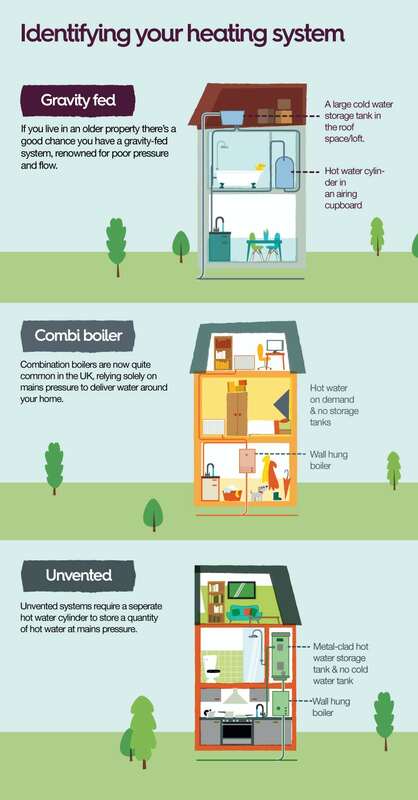 To the uninitiated, this could be quite a daunting task, so that's why we've supplied this handy infographic, which will make it easy to identify your domestic water system. Got a gravity fed system? Normally found in older properties, a gravity fed system relies on a combination of factors: the mains pressure to your home and the distance between the cold water tank (which is normally located in the loft) and your shower head. Both these factors can have a significant impact on the pressure of water coming out of your shower, and older properties typically suffer from water pressure issues. Do you have a positive or negative head? Positive head: Salamander CT50 twin shower pump 1.5 bar or Salamander ct60 1.8 twin shower pump or Salamander esp50 1.5 twin shower pump. Negative head: Salamander esp50 1.5 twin shower pump or Salamander ct60 1.8 universal twin shower pump. Positive head: Salamander CT50 twin shower pump 1.5 bar or Salamander esp50 1.5 twin shower pump. Positive head: RHP 75 2.25 bar twin shower pump or Salamander esp75 2.2 twin shower pump. Negative head: Salamander esp75 2.2 twin shower pump. 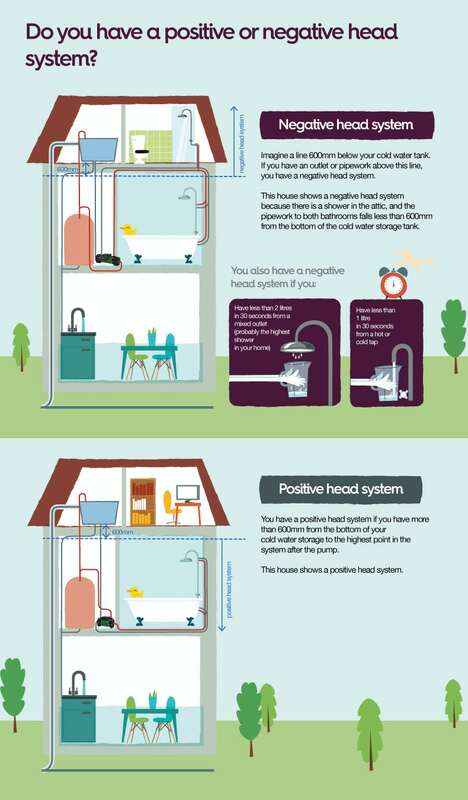 Positive head: RHP 100 3.3 bar twin shower pump or Salamander esp100 3.0 twin shower pump. Negative head: Salamander esp100 3.0 twin shower pump. You can find out more about these different types of pumps in our shower pump buying guide. Very common in modern homes, the combi boiler system is a high pressure vented water system, so there really shouldn't be a need for you to increase the pressure to your shower. If you do have low mains water pressure or have a shower with multiple outlets, you could potentially invest in a whole-house pump. Contact us to find out what options are available to you. Commonly found in properties where there is no room for a cold water tank, this system features a separate metal-clad hot water tank and wall hung boiler. Contact us to find out what options are available to you. Now know which pump you need? Why not head straight to our shower pump section? With our help, you'll soon be enjoying a wonderfully invigorating shower. Want to find out more? Head to our bite-size article on understanding water pressure.